To provide you and your students with an inside look at what it takes to perform at the highest level, Drum Corps International and Bands of America will again present the Festival Workshop Series: Marching Leadership for Students at DCI major events throughout the summer. There are also several other clinics that are presented by the corps themselves prior to tour events. 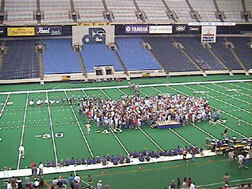 400 band students attended a Cadets' clinic in Indianapolis last summer. Aug. 8 – Orlando -- Phantom Regiment Jeff Fiedler, director of the Cavaliers, is a strong supporter of student workshops, and stressed the importance of such clinics. "I think it spreads the word about the drum corps activity, that there's something out there beyond their marching band experience," Fiedler said. "The members of the corps can share some of our 'secrets' with marching band kids to help to motivate the kids at home," Fiedler said. Noel Alvarez, a 16-year-old snare drummer from Kissimmee, Fla., said he attended a Cadets-led clinic in Indianapolis last summer for "a learning experience, for the excitement, and because it's cool." In addition to learning about leadership, performance and musicianship, some attendees came to learn more about their favorite corps. Cymbal player J.T. Barber, 16, of Land O'Lakes, Fla., said he went to the Indianapolis clinic last summer to learn "what the Cadets are all about." "Student workshops are an opportunity to showcase the amazing aspects of a drum corps performance from a grassroots point of view. Take off the uniform and we see the corps members are just like the band students watching the clinic, but trained and polished after countless hours of rehearsal and an outstanding commitment to excellence in marching music. Drum Corps International is very proud to work with the corps and band directors in each area to bring the drum corps experience closer to the students," said Drum Corps International Executive Director Dan Acheson.